Juicy, delicious, Asian-spiced Grilled Shrimp Appetizers with sweet mangoes and TRISCUIT crackers are easy, flavourful and perfect for summer entertainment! And nothing screams summer louder than mangoes and grilled shrimp. 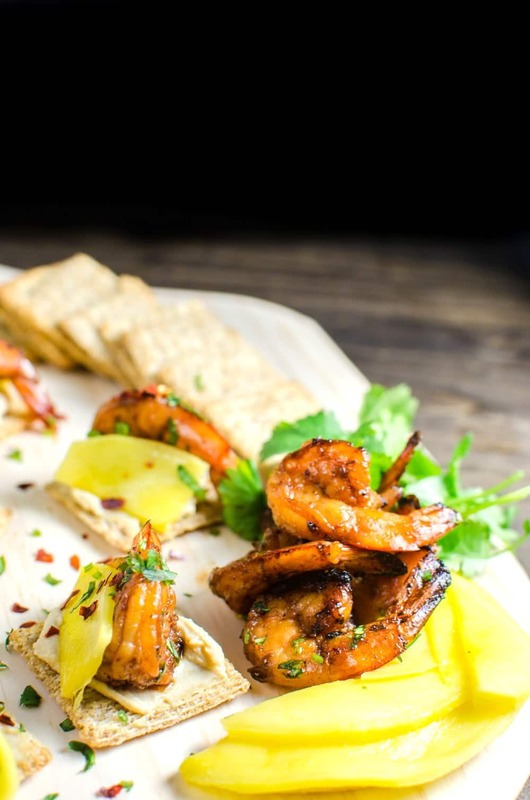 🙂 Shrimp (or prawns) soaks up flavour readily and cooks quickly, and since these grilled shrimp appetizers are also very easy to prepare, they are perfect for crowds, parties and summer gatherings! 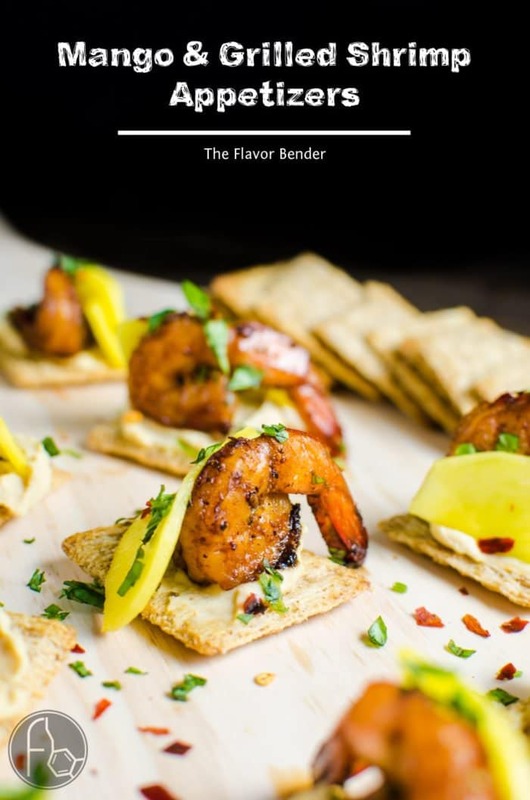 And to make it an easy and fresh appetizer idea, I’m using the mango and grilled shrimp as a flavourful topping on crackers. 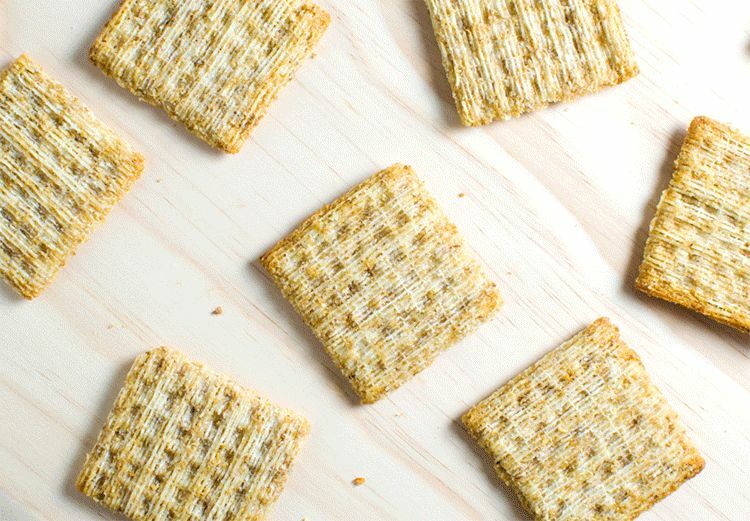 We LOVE TRISCUIT crackers around these parts, and these were truly the perfect pairing! 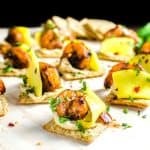 These crackers are delicious on their own, but even better dressed up as sweet or savoury party appetizers. These TRISCUIT crackers come in many different flavours ranging from original to cracked pepper, gouda, sriracha etc. With so many flavors to choose from, and so many choices to top them with, TRISCUIT crackers are definitely made for more!! My favourite way to eat them as a snack, is with hummus or cream cheese. But then, it’s even special when I top them with something grilled. Perfect as a snack, appetizer or if you’re like me, you could eat enough for a meal! TRISCUIT crackers are the perfect canvas for so many delicious toppings! 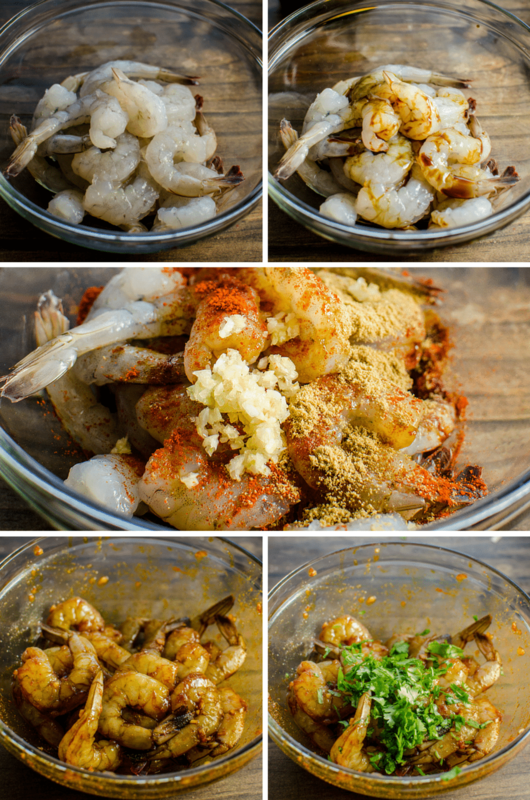 These Asian spiced, grilled shrimps are briefly marinated in Ketjap Manis (a sweet soy sauce), cayenne pepper, garlic and coriander powder and then grilled to perfection for some juicy and wickedly delicious shrimp! 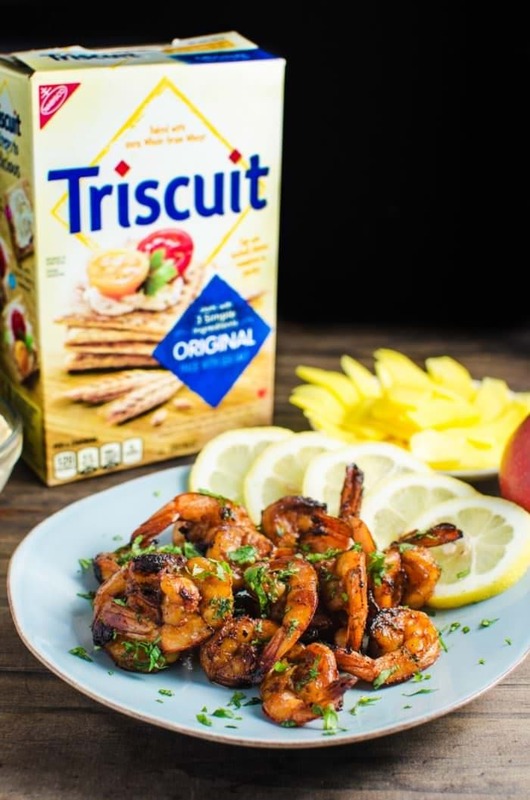 And then all you have to do is take your favourite-flavoured TRISCUIT cracker, spread a generous amount of hummus and top it with juicy, flavourful shrimp and thinly cut slices of fresh, sweet mango and chopped herbs. 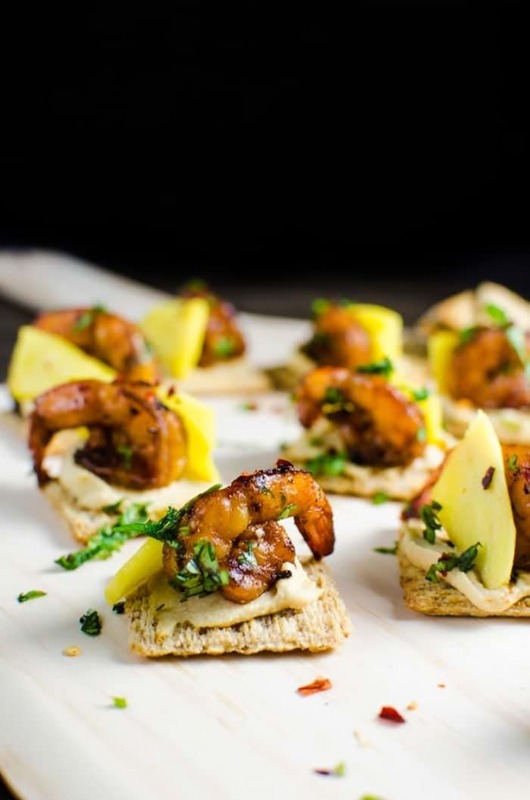 The flavours here are truly phenomenal, they are easy to make, easy to present and look impressive, and you’ve got yourself some fancy appetizers that are perfect for summer entertainment. 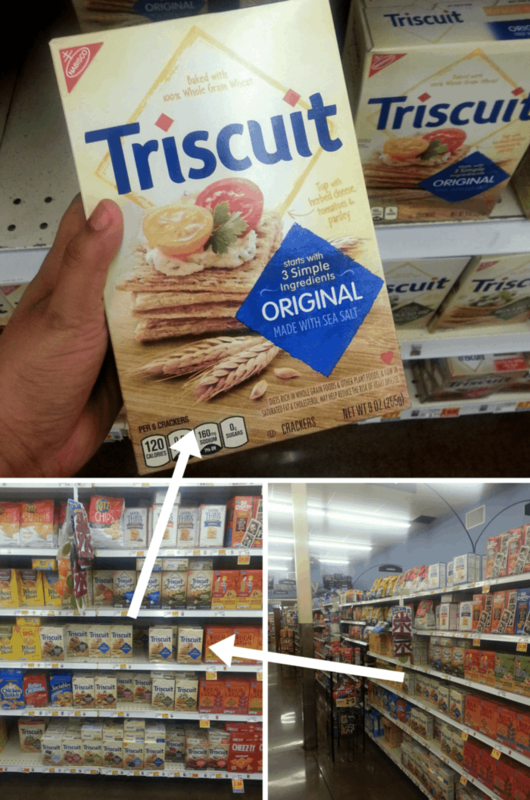 You can easily find TRISCUIT crackers in the cracker aisle at your local Krogers store (which for us was our local Gerbes supermarket). Which wouldn’t be as easy is deciding on which flavour(s) to buy! A note on the shrimp (prawns) – Mr K and I LOVE eating the whole shrimp – tails and all! 🙂 As you grill the shrimp, the tails crisp up nicely. We grew up eating shrimp with tail on, as did everyone else we knew in that part of the world, but if you don’t like it, simply remove the tails before marinating the shrimp. Combine all the ingredients, mix and let it marinate for a few minutes (upto 1 hour). Preheat grill to medium high. Or you can use a nonstick pan or a grill pan as well. Oil the cooking surface generously. When the grill is hot, place the shrimps on it. Cook the shrimps for about 30 seconds per side until cooked through and there’s good caramelization on them. Transfer cooked shrimps to a plate with slices of lemons to serve. Apply a generous amount of hummus on a TRISCUIT cracker. Place a grilled shrimp on top, followed by a slice of mango. Sprinkle crushed chilli flakes and chopped cilantro on top (optional). 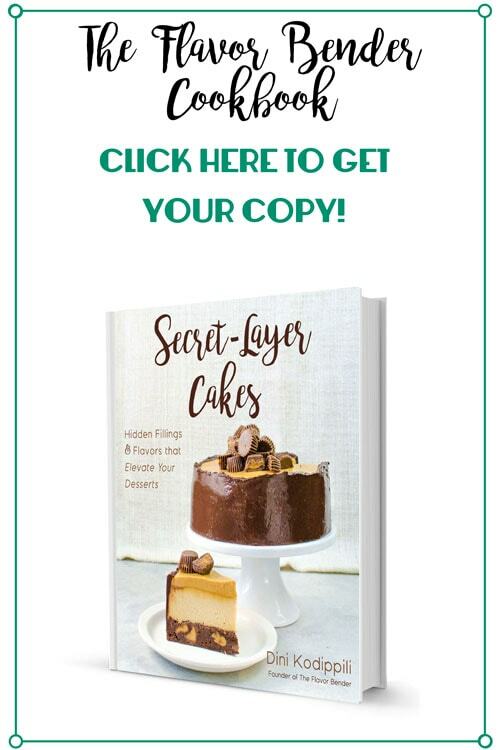 If you liked this recipe, don’t forget to subscribe for new (and free) recipes by entering your email address on the side bar (and get all these recipes delivered straight to your inbox), so you don’t miss out on a thing. You can find me on FACEBOOK, TWITTER, INSTAGRAM, PINTEREST, YOU TUBE and GOOGLE-PLUS too. Wow! These look amazing! Love shrimp and mango together. oh my gosh aren’t these so cute! and perfect for a memorial day party. i just love how char-grilled the shrimp look. just how i like them! Ohhhh wow! Love this combo!!! Just the thought of mangoes is making me drool over here! Thanks for the inspiration! !